We will explain what the Kraljic Matrix or the supply chain portfolio matrix is and how to use 7 Kraljic Models to improve various functions across the supply chain. Kraljic Matrix, also known as Purchasing Portfolio Matrix or Supply Chain Portfolio Matrix, is a method developed by Peter Kraljic in 1983. It is used to create a purchasing portfolio by segmenting items (products or services) into 4 dimensions. The result is that purchasing professionals can prioritize buying activities based on profit impact and level of risks involved. Over the years, the Kraljic model was extended and other dimensions are used to segment various issues under the supply chain environment. More examples can be found in the following sections. As you can see, it looks like the Kraljic matrix as a demand planner. There is a specific procedure to follow for this type of analysis. 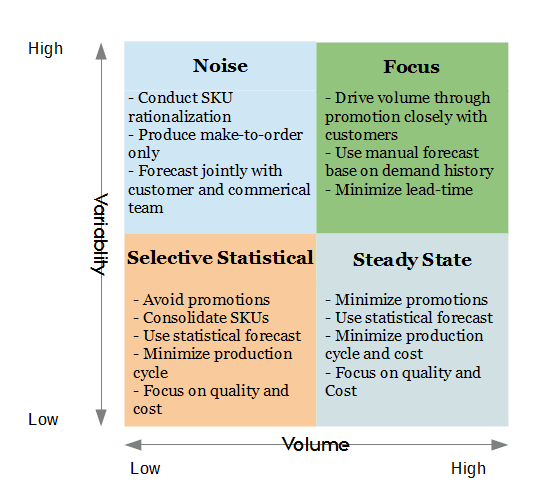 But the quick and easy way is to sort product by volume and use the level of forecast error (MAPE or MAD) to determine the level of variability then put everything into a quadrant. 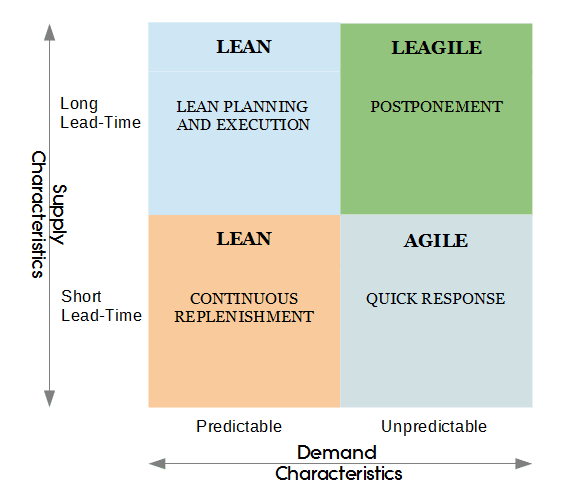 I'm so very sure that most demand planners will choose to attack high variability items in quadrant I and II. 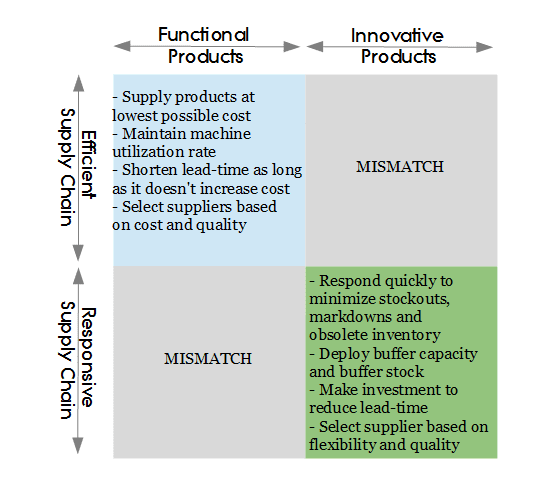 Fisher's supply chain matrix is from the paper on Harvard Business Review by Marshall L. Fisher in 1997 called "What's the right supply chain for your products". Long story short, he said that there are 2 types of products, functional and innovative. Then he proposed what kind of strategy a company should use for each type of product. It sounds simple, but lots of supply chain management practitioners can't break away from one size fits all mindset. For example, if you still select a supplier based on the lowest cost, no matter how long the lead time is, no matter how raw material will be used, you really need this matrix. This matrix looks very simple but can be very effective if it's applied properly. Before using this kraljic matrix, you need to identify the type of risk related to your supply chain. MIT Global Scale Risk can be the starting point. 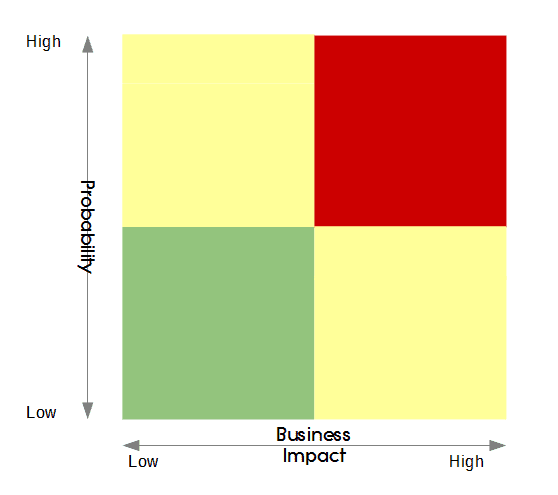 After that, you need to determine the priority of each type of risk based on business impact and probability. The red zone is very clear, you need to mitigate risks in this quadrant ASAP. Green zone can wait. Anyway, the yellow zone can be different from one organization to the other. You need to create the agreed plan what to do with the yellow zone. Lots of paper in supply chain management mentions that Intel Corporation uses the technique called "Customer Window Quadrant" to classify customer satisfaction based on the level of Satisfaction and Importance. The world is more complex than it used to be and the security has become the new burden for every trading partner in the supply chain. In order to avoid potential delay from security screening, a supply chain security program is necessary. In 2007, World Customs Journal published the paper called "Voluntary Supply Chain Security Program Impacts: An Empirical Study with BASC Member Companies". 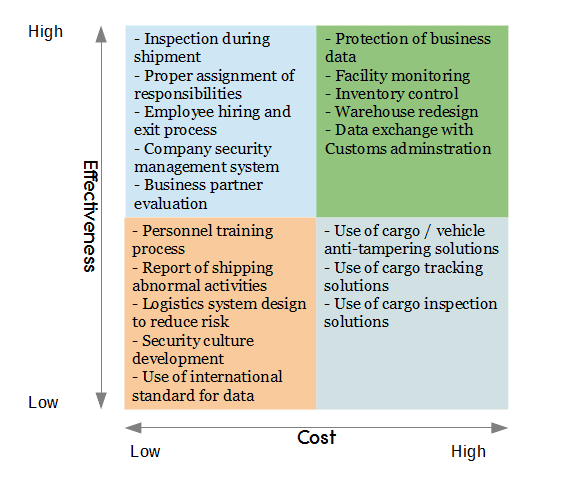 Again, a 2x2 Matrix has been used to prioritize various security measures in terms of cost and effectiveness. Do you think this is a good collection of Kraljic Matrix? - Godsell, J. (2012). Thriving in a turbulent world: The power of supply chain segmentation. - Marshall, L. F. (1997). What is the right supply chain for your product? A simple framework can help you figure out the answer. Harvard Business Review, 3, 105-116. - Christopher, M., Peck, H., & Towill, D. (2006). 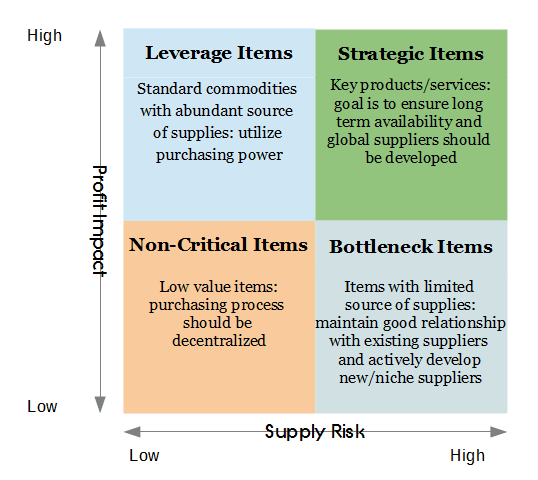 A taxonomy for selecting global supply chain strategies. The International Journal of Logistics Management, 17(2), 277-287. - Norrman, A., & Jansson, U. (2004). Ericsson's proactive supply chain risk management approach after a serious sub-supplier accident. International journal of physical distribution & logistics management, 34(5), 434-456. - Intel Corporation. (1997). 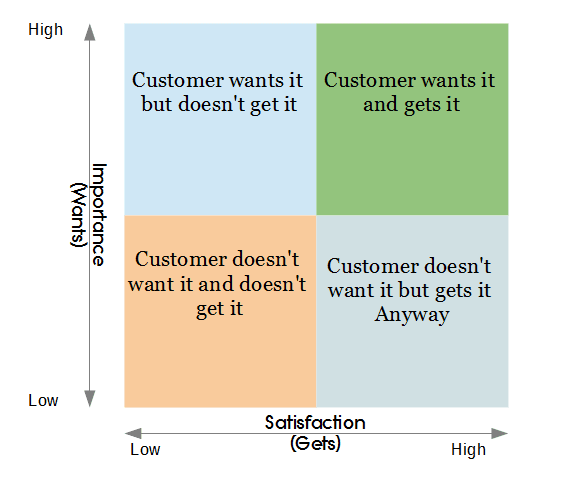 Customer window quadrant. - Gutiérrez, X., Hintsa, J., Wieser, P., & Hameri, A. P. (2007). Voluntary supply chain security program impacts: an empirical study with BASC member companies. World Customs Journal, 1(2), 31-48.